In a petrol engine, petrol derived from crude oil is used as fuel. So, you can run your vehicle smoothly. An internal combustion engine is operated by liquid or gaseous fuel also. Hence, the fuel supply in Petrol Engine is essential for engine running. 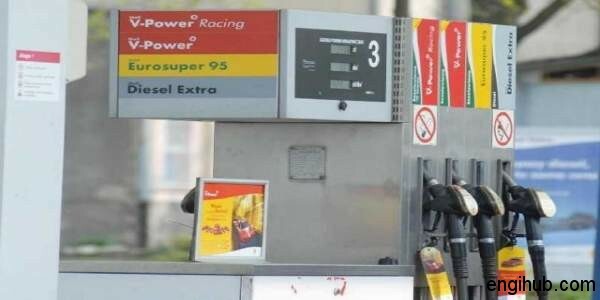 Actually, gaseous fuel is most useful due to high octane rating, less deposit trouble, and clean operation. But the use of this type of fuel is mostly restricted to those areas where gas is available. It is also quite difficult to carry gas for automobile purpose. However, in many metro cities compressed natural gas (CNG) is available and many vehicles are running on it. Still today liquid fuels, obtained from Petroleum (Crude Oil) are used to the largest extent primarily. This is due to large quantities of energy per unit volume. Also, the ease of handling, storage, and transportation. This type of fuel has some engineering disadvantages as like, vaporization, and atomization or at least partly vaporized during the process of mixing. What is the fuel supply system in a petrol engine? The fuel can be supplied to the petrol engine under gravity or under pressure. Here, the fuel flows to the engine under gravitational force. In a gravity system, the fuel storage tank is placed at a higher level than cylinder head. This system doesn’t require the fuel pump. Here, the fuel from the fuel tank is forced by the fuel pump through the filter to the carburettor. In Pressure System, the fuel tank is placed at a lower level than the petrol engine head. Sometimes away from the petrol engine also. For example, motor cars, trucks etc. Keep the fuel tank away from the hot engine. So, we can avoid the chances of catching fire in the event of an accident. In a fuel system for a petrol engine, the fuel storage tank is located well below the carburettor. The fuel is supplied by the fuel pump to the carburettor through the fuel filter. Hence fuel filter removes the dirt and other foreign particles from the petrol. 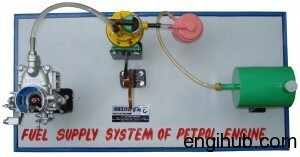 This system is extensively used for motor cars. A diaphragm type fuel pump is used in petrol engines as there is no need for an extra high pressure of the fuel. So, the fuel pump is extensively used to pump the fuel from fuel tank to the carburettor in the automotive engines. A flexible diaphragm is moved down against the force of the diaphragm spring. This is done by the diaphragm lever and the operating arm which is actuated by the camshaft eccentrically. The pressure falls in the pump chamber; hence the fuel from the fuel tank flows through the fuel inlet valve. Fuel inlet valve closes at the return stroke as diaphragm spring forces the diaphragm upwards. Same time fuel outlet valve opens and thus the fuel starts flowing from the pump to the carburettor. To get rid of unwanted dirt, filters are used. So, a filter used to clean the air is known as an air filter. Fuel filter cleans the fuel, whereas oil filter cleans the lubricating oil. In filters, paper elements, cloth elements, felt elements and the combination of felt and cloth elements are used. This is the device which mixes the fuel with air. A carburettor supplies this mixture to induction manifold of the petrol engine. The carburettor controls the required quantity of fuel and breaks up into minute globules. Afterward being mixed with the correct quantity of air.